How Do I Fix Windows Update? - Ask Leo! How Do I Fix Windows Update? Windows Update can get confused or stuck. I'll review a way to fix Windows Update that I refer to as the "nuclear option". I returned from vacation and found that Windows Update would not download any of my 90 updates (even though it sat for many hours saying “downloading” nothing was coming). I eventually used Windows Readiness program and was able the to get 15 or so downloaded and installed but trying the next group again it is not downloading anything. There is no error message, just no action at all. … neither of which helps in many cases. Fortunately, Microsoft has outlined what I’ll call the nuclear option: resetting Windows Update completely. Regardless of the problem you’re faced with, if it involves Windows Update, I suggest you give this a try. Microsoft currently has a Knowledge Base article, How do I reset Windows Update components?, that includes both manual instructions to fix Windows Update (which I’ll cover below), and tools you can download and run to automatically fix Windows Update. For Windows 10, it’s the “Windows Update Troubleshooter”, and for prior versions of Windows, there are “Fix It” troubleshooters. I strongly recommend you first try the tool appropriate to your version of Windows. In theory, it’ll perform the manual steps for you, and presumably resolve any issues that can be resolved. Hopefully that will work, and you won’t even need to read the rest of this article. #1: Following the instructions below incorrectly – heck, perhaps even following them correctly – could damage your Windows installation. I strongly recommend that you take a complete image backup prior to performing these steps, and that you be prepared to restore that image backup should something go wrong. Something shouldn’t go wrong, but an image backup will protect you – should I be wrong about something not going wrong. #2: By following the instructions below, or downloading and using the batch files I’ll provide, you are assuming complete responsibility for the results. For all I know, there’s something special about your machine I cannot predict or account for. While it’s certainly not the intent, the instructions and/or my batch files might render your computer unbootable. Once again, your best defense is the previous important note #1. 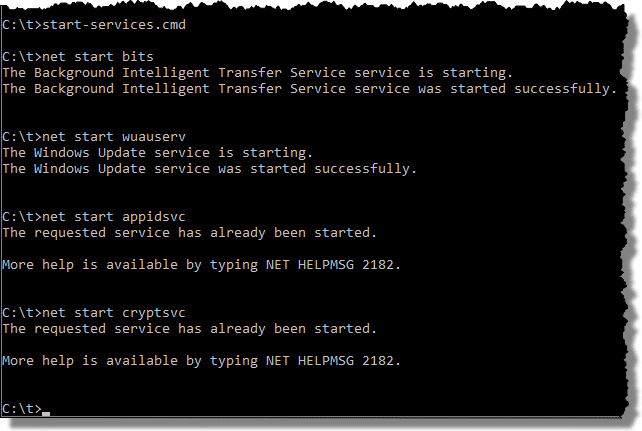 #3: Since several of the steps below are sequences of commands to be entered into a command prompt, I’ll provide a few batch files that will run those for you. DO NOT just click and run. Instead, download the file by right clicking and saving to a location on your computer. You’ll run those batch files from within an administrative command prompt. Since these are text files, you can examine their contents at will. Note that since they are considered executable files, your security software may need to be told to “allow” the download. All of the steps that follow require administrative privileges. It’s not enough that your log-in account be administrator; you need to run the Windows Command Prompt as administrator for those privileges to be in effect. 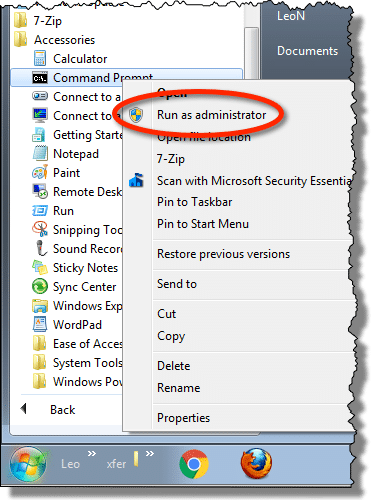 In versions of Windows prior to 8.1, right click on a Windows Command Prompt shortcut, and click on Run As Administrator. 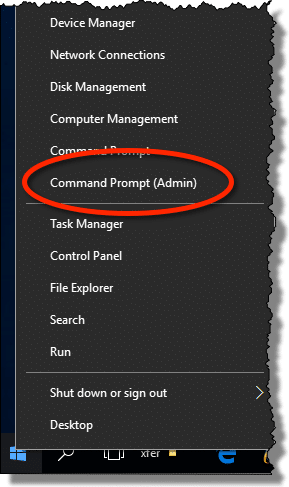 In Windows 8.1 or 10, right click on the Start menu and click on Command Prompt (admin). 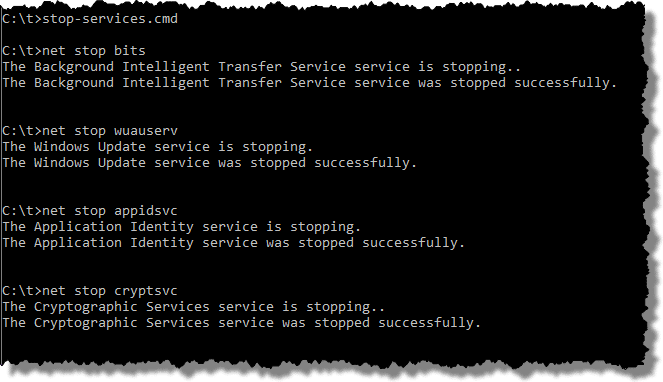 Or download and run stop-services.cmd. Don’t worry if some of the services report an error that they’re not running. Next, we’ll delete a set of files related to the download manager. Or download and run delete-qmgr-files.cmd. Microsoft recommends you perform this step only if running through these instructions without this step did not resolve the problem. They also state that this step is performed by the “Aggressive” mode of the various “fix it” solutions mentioned earlier. What Microsoft doesn’t mention is that the first two commands will fail if they’ve been run before – meaning that if the backup folder “%systemroot%\SoftwareDistribution.bak” already exists, or the backup folder “%systemroot%\system32\catroot2.bak” exists, the rename will fail. If that happens, do not proceed until you have removed the pre-existing “.bak” folders manually. Since “%systemroot%” is typically “C:\Windows”, look for “C:\Windows\SoftwareDistribution.bak” and “C:\Windows\system32\catroot2.bak”, and either rename them to something else, or delete them. (You did take that image backup, right?  ). Here’s a batch file that includes those commands, but also pauses after the rename to give you an opportunity to abort: reset-software-distribution.cmd. Or download and run register-dlls.cmd. As unnerving as that may seem, that’s OK. Not every system is configured the same way, and thus not every DLL will be present. Or download and run reset-network.cmd. Now we restart the services that we stopped earlier. Or download and run start-services.cmd. Microsoft’s instructions include installing the most recent version of the Windows Update Agent, which you can do here. There are no instructions for Windows 10, so presumably this is not an option for Windows 10-related issues at this time. Naturally, much of what we’ve done will require a reboot to take final effect. After all that mumbo-jumbo, you’re probably wondering what it is you just did – be it manually or with a fix-it tool. The best analogy I can come up with is that this is very similar to clearing your browser cache. Just as your web browser tries to avoid multiple downloads and generally speed up your web browsing experience by keeping many things in a cache on your machine’s hard disk, Windows update does something similar. Rather than re-analyzing, slowing down your system, and perhaps even downloading information repeatedly, it caches much of what it learns about your system on disk. And just like the browser, sometimes the cache can get “confused”. We’ve simply cleared out the cache and reset a few things to known states, so that Windows Update can start with a clean slate. Get the Windows 10 Creators Update Now, If You Like - If you're eager to get the newly released Windows 10 Creators Update, I'll show you how. How Do I Get the Windows 10 Creators Update 1709 to Install? - Every Windows 10 update should just work. Unfortunately, for some, they just don't. Installing the Windows 10 Anniversary Update - The Windows 10 Anniversary Update can be installed manually. With the help of some time-lapse video I'll walk through that process, quickly. How Do I Disable Windows Updates in Windows 10 Home? - Windows 10 Home edition gives you little control of Windows Update. I do have a fairly large hammer you can use. 1: Note that Windows XP and Windows Vista may have additional or different steps. Refer to the original Microsoft Knowledge Base article for specifics. « Previous post: Why Do Websites Use Pop-ups? Finally I’m no longer being reminded that a Defender Update I don’t need failed to install, again and again and.. I tried all that on my Windows 7 desktop to no avail, so I just took the free Windows 10 upgrade and I either solved, couldn’t find, or forgot what was wrong in Windows 7 in the first place. However, I am very happy with Windows 10 and glad I now have time to read Ask Leo archives. Twice, I’ve had update problems on someone’s machines. The first time, on a Win7 machine, Windows Fix-It fixed the problem. The second time, on another Win7 machine, it didn’t work, so I did more research, with my favorite research tool, Google. Click on Computer, System drive (usually C), Windows, SoftwareDistribution, Download. Delete contents of Download folder. Restart computer. Thanks Interesting that 1 !! sure to try !! i had the same problem. I had to update a windows 7 laptop from a friend which was not used for a long time. Renamed the softwaredistribution folder (in windows, not command line) and updates started coming in! Thanks Leo. Any info that comes from you I gladly rely on and trust completely, you are a valuable resource to be sure. Enjoy also your writing style, which is, how to describe it, pleasant. I have a very simple solution which may cure Windows Update problems. I am running Windows 10 pro and I always get a message that Windows Updates failed to install. I then turn on the Windows Firewall and the updates download and install. I don’t know why this is as I already have Vipre Internet Security running but it works every time. Bizarre! Does disabling the firewall in VIS enable updates to install. I could be way off with this, but the only possible explanation I can come up with is that VIS is actually the apps that’s blocking the updates, but Windows Firewall somehow overrides its settings when turned on. When I run Windows Firewall to enable me to download Windows updates, I still leave Vipre running. I tries shutting down Vipre without enabling Windows Firewall but Windows Update would not work without enabling Windows Firewall. Don’t know why this is but it is the only way I can download and install Windows Updates. This only refers to Windows Updates! Strange but it works on my Laptop. I still suspect that VIS is causing the issue. Security programs can be resistant to being shutdown. It’s basically a defence mechanism against them being automatically closed by malware. Next time it happens, instead of shutting VIS down completely, try disabling its firewall component and see what happens. I just talked with Vipre and he told me that we might need to re-set the firewall, in order to not have any more issues. I thank you for bringing this to light though. I have the Home version of win10, and it wants to DL updates for defender, which I don’t use. I really wish they would tell me when updates were coming, although I can figure it out, when other programs are acting funny. @Robin Given Dave’s comment – and the fact that the issue does indeed seem to be related to VIS – I’d replace VIS with something else. Getting updates in a reliable manner is extremely important. Other solutions would provide you with similar protection – likely better protection, in fact – without interfering with Windows Update. I’m definitely bookmarking this article. Leo, does the procedure in the article also apply to fixing Microsoft Update? If not, I hope you’ll write an article on fixing Microsoft Update, too. I believe that they are, ultimately, one in the same. You might want to wander over to askwoody.com. Many people having the same problem. Some mentioned the same thing with XP at its end. If I was Paranoid,I might suspect that Microsoft is putting most of its servers towards W10 and letting the rest of us suffer,unless we upgrade. Luckily,not being paranoid,I would never think such a thing. I am having the same thing happen on both desktop w7-64 and laptop w7-32. Update failing are going more and more frequent, but not for all updates. How to know wich update is absolutely mandatory and be worth doing all that complex task?? I keep my Windows Update checked on the CHECK FOR UPDATES BUT LET ME CHOOSE WHETHER TO DOWNLOAD AND INSTALL THEM, and then when updates do come up for installation and downloading, I google each by entering “definition of KB(update number). If it applies to my Win7 OS or is mandatory, I install it. On any updates that that have something to do with Win10 or does not apply to my OS, I right click on them, and then click on “Hide this update”. Regarding having problems with Windows Update, I have had the problem of clicking on “Install and Download Updates” but nothing happened…twice. It just had the appearance of of installing/downloading…..FOR A LONG TIME. I thought it was just a glitch in the system, and because I wasn’t aware that this problem had a solution like the one Leo has shown above, I just powered off my machine after trying everything I could think of doing first, of course. Powering down was my LAST resort. I didn’t even think to make a system image before doing this…but it worked. The things is that most of us do not have the knowledge to know which updates to take and which to ignore. The more you mess around with it the more likely future updates will have problems. If you feel that you need to be in complete control of your machine then it would be good to explore moving to Linux. Microsoft is forcing updates because the vast majority of Windows users wouldn’t be able to make an educated decision on which updates to install. They did this to protect them against malware exploits. These updates might cause some problems, but in the long run, those updates prevent many more problems than they might cause. It’s comparable to vaccinations. In some cases, they may cause illness, but in the long run, they prevent many more serious epidemics. Windows update was stuck for hours on checking for updates while doing an upgrade to Windows 10 from 7. The “Automatically diagnose and fix common problems with Windows Update troubleshooter” helped to unstick it with quick results. Leo, do you have confidence that these actions will repair the inability of Windows 10 to download / install the cumulative update for Windows 10 Version 1511 for x64-based systems (KB3140768)? There seems to be hundreds / thousands (or more?) of users with this issue (from what I can tell by visiting the Microsoft Community). Probably not. I’d wait until Microsoft address the issue. I don’t know, but what I can tell you is that it should not hurt to try. Can you tell me why MSN freezes. It stops and indicated that explorer is not responding. If I wait it will restart. It’s a pain when I’m right in the middle of a project. Is there a cure for it. Is there an update coming? This reply is after almost two years (I came across the article after Leo’s updates-related posting 693, 27th Feb 2018), but it may help someone with the same issue which I also had, viz the manual or automatic update hanging with high svchost.exe CPU of 99%, making the computer unusable unless updates were turned off completely. I did try re-setting the update components as described here, and appreciate Leo’s help with the batch files, but unfortunately to no avail. Incidentally, the original instructions from Microsoft were in KB971058 which has now been withdrawn, but I was able to find them through Internet Archive, as I had to modify them for use on an old XP computer, configured to receive the WEPOS updates. In the end what worked was a posting I discovered on an MS Social Technet website, “Windows Update Hangs – 100% CPU svchost”. The simple solution was to uninstall Internet Explorer 8. I did this and re-booted, and after months of problems the updates started flooding in and CPU use went back to normal. Much to my surprise, I didn’t even have to re-install IE8, as manual updates appear to have been re-enabled via IE6. I am running Win 7 64 on i52500K with 8 gig ram used mainly for hd video and music in a rural location with 5 gigs metered mobile. It will only update Windows when set to auto. Last month it installed a 250mb compatability pack for Office 7 – no use for 2003. I can’t afford to put it on line anymore let alone even consider Win 10 from what I gather. MS is taking away the use of what I purchased in good faith. I guess at 81 it’s farewell to having a PC on line. Any suggestions? I’ve installed Linux Mint on some friends’ computers, and they were all happy with it. It might be an option for you. Well I have been through XP, Vista, 7 and now using Android so I’m not too old too learn another. Never use a computer until 03. Would Mint run my Adobe Photoshop and Premiere Elements 10 and Office 03 mainly Word I like. Also like Outlook but have a hunch it is more data efficient to send files by Gmail directly. Am I correct? If you use programs like Photoshop, it would probably be better to stick with Windows. Windows 10 professional allows you do defer automatic updates. Had a thought after my reply. My hd is 1 tb. Could I creat a partition for Mint for the few on line things I do (much now is on my tablet) and keep Win 7 unpatched and off line? I’m still using my first computer purchased end of 03 with XP for recording fm music and totally off line. It can be set to dual boot. Mint even gives you that option on installation, so you don’t have to think much about how to do it. An unpatched Win 7 would be relatively safe if you never get online with it. Maybe you can do manual upgrades at the end of the month when you have a couple of GB available on your plan. Maybe Leo has better suggestions as he has worked on a metered connection with a data cap. “Also like Outlook but have a hunch it is more data efficient to send files by Gmail directly.” – No, the bandwidth usage would be pretty much exactly the same whether you use webmail or Outlook. My laptop with 4 GB RAM & 2.1 MHz CPU running Win 7 provides good performance most of the time IF “Win Update” service is stopped. Otherwise the svchost process takes almost 50% of CPU cycles. This config works well until Win Update runs when an apparent freeze results – any update activity appears to “hang” even after running the “nuclear option” described in recent AskLeo blog is run successfully. Is there any hope for this situation especially considering that MS no longer is interested in improving Win 7 ? Also my desktop which has 8 GB RAM and runs Win 7 appears to “choke” while applying certain fixes (KB3080149 & KB3097966 among others) individually. During the required restart a msg appears which says “do not turn off”. However the only recovery for me is to power down and take the subsequent option to start Win normally. Can anyone help this poor but honest user apply updates to Win 7 ?? UPDATE TO WIN 7 UPDATE FAILURE POST – i cannot apply even one optional update ( MSE definitions @ 225K). What shd only take a few minutes runs for hours but fails to apply the update. What is wrong ? (2) System File Checker (SFC) completes normally – no problems found. Running Windows 7-64 on Dell Inspiron notebook. I have the same problem with Windows Update appearing to freeze. I reinstalled my computer from an image backup from before the last successful windows update, but the problem still happens. So I am sure the problem is not on my end.. Doing some searching, someone suggested turning off Windows Firewall. I did this and, after a long time the updates finally happened. Microsoft screwed up with Windows 8. Now Windows 10 is screwing up everything! Way to go Microsoft. Maybe Bill Gates needs to come out of retirement and get Microsoft straightened out. I had to enable windows firewall before the updates would install. Wonder why? Searching for the solution to something else today I ran across this post, noting that it’s something I found elsewhere last week while trying to fix a Windows Update issue (turns out for us the anti-virus we use didn’t properly disable Defender on the affected machines, causing them to fail to report to our WSUS server and possibly to be updating at all). All the same commands in the same order. I ended up making a couple slight changes after bundling it all into a single batch file. You mention the possibility of the line “Ren %systemroot%\SoftwareDistribution SoftwareDistribution.bak” failing if the folder already existed. I got around this by adding “If exist “%systemroot%\SoftwareDistribution.bak” rd /s /q “%systemroot%\SoftwareDistribution.bak”” in the line before it, and doing the same for catroot2 (making the appropriate path changes, of course). I also added the /s switch to all of the regsvr32.exe calls to suppress the dialogs since whether or not they fail is immaterial. One other thing I noted which I couldn’t get around with the batch file was that in most cases trying “net stop wuauserv” would fail. I’d have to force it to quit in services.msc or even make the service manual then stop it. Not once would it respond properly to the net stop command. Hopefully you and others find this helpful. Soooo…I clicked to let update download them BUT it sat there hung up in download mode as before. Then suddenly I got an idea–I changed the download method to ‘automatic’, restarted the computer and tried again. The updates were then downloaded and installed within a few minutes! My conclusion (as I had suspected)–Microsoft has ‘updated’ my old Vista machine to act like Win 10, i.e. to no longer give an option to control your own downloads in Vista, but to let Microsoft be in control. (I saw this happen on my newer Win 7 machine when my preferred download option never worked the way I had it set, until, interestingly, I downloaded GWX control panel and set my preferred option through that program (at least I don’t think it was a coincidence that it started working after I installed this program, and now I’m afraid to uninstall it lest I suffer the old problems again). Hope this is helpful to others. As I said, I would also like to know for future reference if there is a reason that just downloading from the Microsoft site directly might mess up my machine somehow? For readers who, like me, have been experiencing the very frustrating problem with super slow Windows Updates on a Windows 7 PC, here’s a possible permanent solution. I’ve been having problems with Windows Update for many months. Most of the time, there was no problem scanning/detecting the updates. However, downloading and installing the updates took half a day usually and often several days of repeated attempts. Recently, I started having problems with detecting the updates also. The solution that worked for me (so far) involves installing KB3172605. For detail on what to do, go to InfoWorld.com and search for a Nov. 4, 2016 article by Woody Leonhard (“How to speed up Windows 7 Update scans – forever”). After I installed this speed-up patch, my PC scanned, downloaded, and installed the monthly Windows updates in less than 15 minutes. This solution has worked on both of my Windows 7 PC’s. What a relief! It takes a village to maintain my PC’s. Thank God for people like Leo, Woody, and many others who freely share their expert knowledge. I have gone through this once and it didn’t work yet. My question is when I try to delete the qmgr files it says the path is not recognized. I typed out and I used your link. I really think this would work if I could get past that step. My computer was running slow so I reinstalled windows and right away started having problems with Windows update. I have run the troubleshooter several times. Is there another way for me to find that? I did a search for it on my computer and it is not finding it. I wanted to add to my previous post. When I type in the line to delete the qmgr*.dat files I get this error “the system cannot find the path specified”. What can I do to make this work? Another problem I am having is in the section of re-registering dlls. I get an error of “____ was loaded but their entry point dll register server was not found. 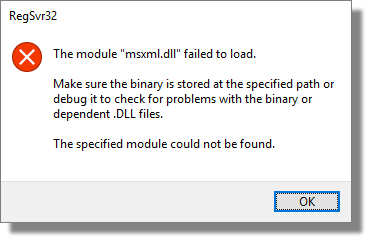 Make sure______ is a valid dll or ocx file then try again.” I got that error on several of the dlls and I am not sure what to do. Can you please help? Leo – I was just over at the Microsoft site, and their commands are exactly as what you have posted. However, I believe downloading and using your batch files will greatly reduce the chance of typing errors and speed things up immensely. I am going to give it a try. In my above post on March 17, 2016, I mentioned how I was having problems with (1) the monthly Windows update (super slow) and (2) the Microsoft other products update (can’t update) on my Windows 7 PC’s. Then in my above November 12, 2016 post, I described a solution I found that fixed the very slow Windows update issue. Now I want to share a solution I found to the problem I had with the Microsoft other products update. •	Go to http://www.Update.Microsoft.com, and now the page should display correctly. And as a result, you’ll now have the opportunity to download and install the software that will re-establish the Microsoft Update setting in Windows Update. Running Windows update again generated for me 8 additional important Microsoft products updates, a few which were released a couple of years ago. I find it hard to believe that a Microsoft website was not being displayed correctly by Microsoft. However, though it was hard to find, I’m glad there is an easy fix. With respect to the current WannaCry hack, people who can’t install Windows Updates are in trouble. That includes me. I have Windows 8.1 and have not been able to install updates for the last 7 months—it either hangs for hours during the search or generates an error message like 8024A000. My problem: I’m not a computer expert. I’m an ordinary person with a low level of computer knowledge, like millions of others. I have spent at least 50 hours researching this Windows Update hanging problem. I have implemented about 20 solutions suggested at websites like this to the best of my ability, with no success. I simply don’t have the ability to reinstall Window Update as suggested here. To attempt this would be suicidal. Of course I’m unable to install security patch KB4012598. One problem is that after each solution attempted, you would have to let Windows Update run overnight to find out whether it worked. That could take days upon days. There must be thousands of people like me who can’t install the WannaCry security patch because of a Windows Update problem AND who don’t have the technical ability to fix that problem. A double whammy from Microsoft! I’m tearing my hair out. 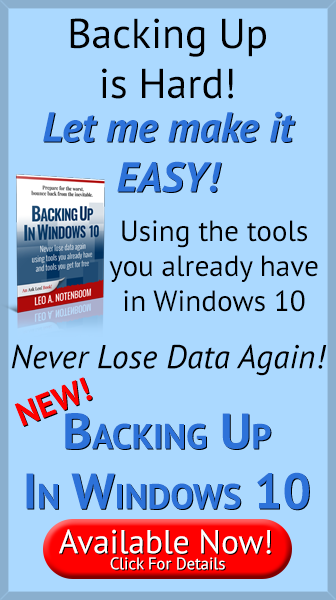 If Windows update is THAT broken – that the fix outlined in this article cannot or will not work, then you have exactly one solution: back up your system, and reinstall Windows from scratch, taking ALL updates until it’s completely up to date. I was recently having problems with update. My settings on Windows 10 Home were for automatic but one failed and I had to update Windows defender manually. I realized that I had recently changed settings for the Internet to a metered setting. When I turned it off everything worked fine. Whether it was the metered setting or that I had changed something is ???. The metered setting blocks automatic updates. The’s the main reason it exists, to prevent upgrades from using up your bandwidth allocation. Many people use that setting to block updates. Thanks for documenting this manual process. MS retired the article it is based on, KB971058. They literally did it over night. I was looking at the KB yesterday. Today it redirects to the automated page.